Activase (alteplase; Roche/Boehringer Ingelheim/Kyowa Hakko Kirin) is a recombinant tissue plasminogen activator, and is a manufactured version of the tissue plasminogen activating proteins found naturally in endothelial cells. Activase (alteplase; Roche/Boehringer Ingelheim/Kyowa Hakko Kirin) is a recombinant tissue plasminogen activator, and is a manufactured version of the tissue plasminogen activating proteins found naturally in endothelial cells. Activase works as a catalyst, binding to fibrin-entrapped plasminogen in the thrombus and converting them into plasmin. These plasmin molecules then initiate local fibrinolysis, breaking down the fibrin that comprises the blood clot. This process results in the breakup of the blood clot, allowing for blood flow to be restored to the brain. Activase is the only thrombolytic therapy approved for the acute treatment of ischemic stroke. Activase has gained strong uptake in this market due to its position as the primary alternative to surgery in patients who have experienced an ischemic stroke. 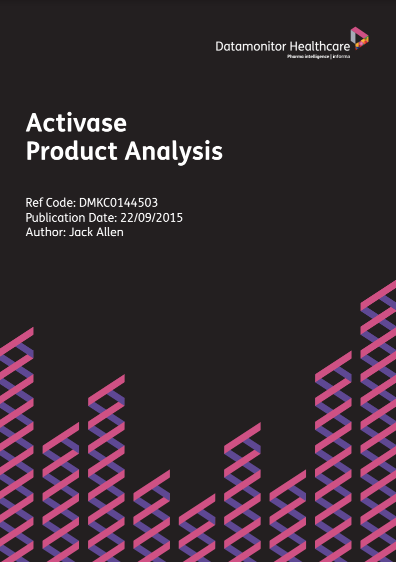 However, Activase’s commercial potential has been limited by restraints surrounding the administration of the drug. The medication may only be administered by an appropriately trained physician within 3–4.5 hours of the onset of symptoms, which has limited the drug’s potential patient population. TNKase (tenecteplase; Roche/Boehringer Ingelheim) (Phase II) is currently in development by Roche as a potential follow-on therapy to Activase. This follow-on therapy will allow Roche to capitalize on its strong market presence in the acute treatment of ischemic stroke.